Apple acknowledges the iPhone 4's reception problems. Their solution: Hold it differently or buy a case. But if this is an Apple design problem, they should fix it for real or give out cases for free. We have evidence that proves that the iPhone 4 antenna problem was caused by an internal cultural problem at Apple, one that plagues more than just the iPhone 4, but the iPad and probably future Apple products as well. A source in Apple's engineering team tells us that the kind of reception issues found in the iPhone 4 are a symptom of an internal issue that's been going on for a while—extremely inflexible mandates around the industrial design of products during their development. Jon Ive and his team of industrial designers can run "a little amok sometimes", they said, coming up with and steadfastly insisting on designs that, while aesthetically pleasing, cause the engineering team extreme difficulty in terms of implementation and maintaining the highest levels of functionality. Apple engineers have evidently had a tough time trying to mitigate things, for example, like thermally-challenged designs and issues related to the fact that wireless signals don't go through metal. So perhaps this inordinate power wielded by the industrial design team at Apple is at least one factor contributing to a phone design that allows people's hands to interfere with the antenna. Now, Apple is facing public backlash over the consequences of those design decisions. On top of the many user submitted complaints the press received, many with video proof, we took an informal poll. The results: About 40 percent of iPhone 4 owners responded that they had seen the issue first hand. Other sites report similar percentages. Righmobilephone—a cellphone comparison site in the UK—took a pool among 836 iPhone 4 users, finding 93% affected by the problem (a theory here is that people in the US notice it less because they blame AT&T's traditionally lousy network). Of those, 63% were "particularly angered" about Steve Jobs' response, which suggested users should "avoid holding the phone in that way" to avoid loss of signal. This is an unprecedented amount of user complaints. 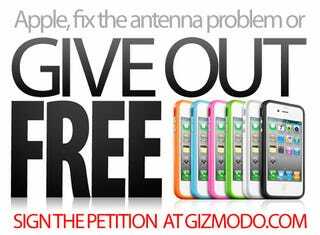 In our daily lives here in Gizmodo, we have experienced the problem many times, ruining an otherwise great experience. Some of us didn't run into the problem at first, but after a few days, we clearly noticed it. At this point, it seems to us that the question is not if people would experience the problem or not, but when would they experience it. Apple argues that all cellphones' signal drops when you touch their antenna. That is true. But the difference here is that the rest of the phones don't have the antenna all around the phone itself, where the user is touching it at all times. That's why Steve Jobs' "hold it in another way" suggestion is not a good solution. Users should be able to hold the iPhone in a natural way, whatever that way is for them. Otherwise, it's bad industrial design because it goes against the user's self-expression. It's a case of form not following function. If this were a case of the problem showing up in a few awkward, unnatural hand positions, that would be something. But the problem can be triggered by the way a right handed user generally holds the iPhone: in their left hand on the side and bottom, pecking at the screen with the other. In other words, the regular way most of us hold an iPhone when using it as a smartphone instead of a voice phone. Holding the phone any other way is unnatural, and in practical usage scenarios, unreasonable. Apple's other solution is that people should get a case. They sell one. The bumper—barring some fix at the factory—is the only real Apple solution for this design problem. If Apple doesn't fix this design flaw or provides any technical fix, then they must give free bumpers to every iPhone 4 user. If they say the bumper fixes a problem that is caused by a faulty design, then it only makes sense that they should provide the bumper for free. End of the story. The bumpers will negate the iPhone's beautiful design, one of its major selling points, but at least we won't have signals dropping. It may even help preventing their other design problem: The iPhone 4 is more fragile than the previous generations because of its glass backside. In addition to that, it also shatters on shock more easily because of the inner tension of the new glass material, which in addition is all oleophobic, making it more slippery. Every product launch has its bugs. We've seen a lot this time. Many issues, like the yellow screens, will go away as manufacturing fine tunes and adjusts to solve the problems. But the antenna issue is a fundamental one, a design flaw, that won't go away as easily without adjusting the product in a deeper way. If this was some junk phone, it wouldn't matter. But the iPhone 4 is perhaps the best cellphone there is thanks to its software and apps, its Retina display, and its camera. Some even say the reception is better than the old phone's under circumstances when the antennas aren't being shorted. So with all these great things, it's terrible that buyers should have this excellent phone ruined for them because of a single, but serious, design problem. And even worse that Apple should suggest users use their phones in unnatural ways or shell out $30—for what is essentially a double wide livestrong armband—to fix it. That's why we all should ask Apple to partially solve the phone's design problem by giving away free bumpers for every single iPhone 4 user out there. Together, we can get Apple fix their problem, whatever the solution may be, instead of dodging the issue. It's all in your hands: If you agree with this petition, please sign it below, in the comments.